Three years after killing off Missouri’s latest statewide tobacco-tax proposal, the group representing many Missouri gas stations and convenience stores has filed two initiative-petition proposals of its own to hike the tax. Missouri’s tobacco tax is now 17 cents a pack and is the nation’s lowest. The Missouri Petroleum Marketers & Convenience Store Association’s proposals would increase the per-pack tax to 40 cents by 2021. 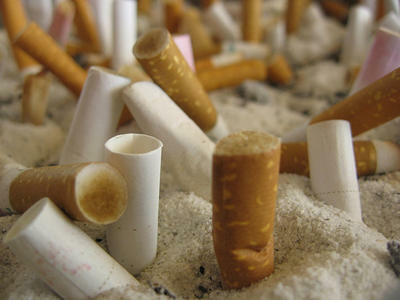 The association, which played a major role in defeating three proposed statewide tobacco-tax increase since 2002, would ask voters next year to phase in a 23-cent increase in the state’s taxes on a pack of cigarettes that could go to either transportation or general revenue. That’s well below the three proposed hikes — ranging from 55 cents a pack to 90 cents — that the association campaigned against in 2002, 2006 and 2012. Its latest proposals are also well below other proposed hikes being bandied about, which range up to a rumored $1-a-pack increase. Ron Leone, the association’s executive director, says his group’s aim is “to get the dialogue going’’ to perhaps come up with some sort of compromise tobacco tax hike proposal that could be acceptable to all parties. Such a deal might involve legislative approval next session of some sort of hike or at least agreement on the best initiative-petition proposal to present to voters. “We’ve always supported a reasonable increase,’’ Leone said. Trouble was, his group believed the earlier proposals didn’t fit the bill. The group estimates its proposals would raise $800 million over 10 years. The chief difference between the association’s two proposals is what to do with the money raised. One of the initiative-petition measures would earmark the additional tobacco-tax income for transportation improvements. The other would allow the money to be used for any general state spending. Either proposal would need roughly 100,000 signatures from registered voters to make a 2016 ballot. The association notes that the state’s tobacco-tax income has declined over the past decade. In 2004, Missouri collected almost $99 million from tobacco taxes. By 2014, that figure had dropped to $82.3 million, in part because fewer people are smoking. The association contends that longtime backers of a tobacco-tax increase erred by not pressing for smaller tax increases. If supporters had pressed for an increase in 2002 similar to what the association has proposed now, Leone says the state would have collected close to $1 billion in additional cigarette taxes since then. St. Louis – Two Missouri health groups hope to raise the state's tobacco tax by 80 cents to fund Medicaid. But they want to put two competing proposals on the ballot. A coalition of hospitals and health groups wants to raise reimbursement rates for doctors. And a group called the Missouri Alliance for Health and Justice wants to restore recent cuts to Medicaid. That group filed its proposal Monday.